Several events signaled an evolution in the Church’s understanding of race and the uses of power. These included the 1988 and 1991 General Convention resolutions on racism and accountability, the Pastoral Letter declaring racism a sin, and the election of Barbara Harris, the first woman and an African American to the Episcopate. A corner had been turned. 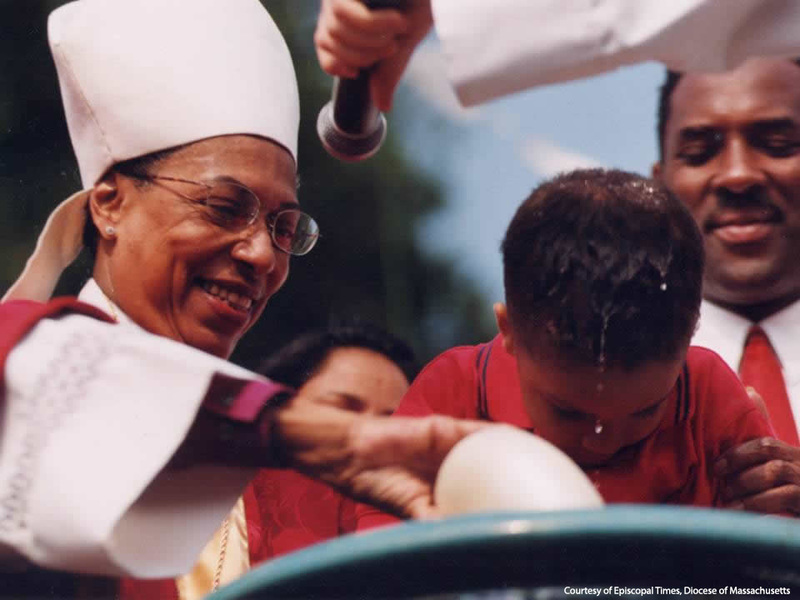 Bishop Harris performs a baptism at St. John and St. James Church in Roxbury, Massachusetts, during the June 11, 2000 diocesan Pentecost Festival on Boston Common. Photo courtesy of Episcopal Times, Diocese of Massachusetts. Flyer from the S.O.U.L. 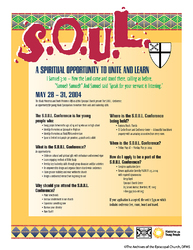 Conference sponsored by the Black Ministries and Youth Ministries Offices of the Episcopal Church, 2004. The Black Experience in the Episcopal Church, a 1986 Forward Movement Publication, written by Lydia T. Wright, M.D.